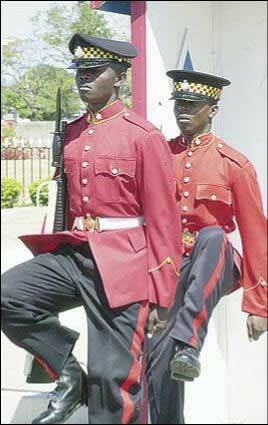 A sentry of the Second Battalion Jamaica Regiment (foreground), marches out as a sentry from the First Battalion takes up position in the sentry box during the change of guard ceremony at the National Heroes Park, Kingston, yesterday. Caption: Squadie did him say left or right,mi nuh know but a left hand and left foot mi use..
Caption: Which right foot again mi must use? Caption: lef, rite, lef , rite, me a wear dem dung, yuh think govament gimme dem fi pudung. Caption: "Ah hope him no find out that this is how me shine up de shoes!" Caption: the other right soldier. Thank you for the 266 responses we received. Enter again and we hope you will be the outright winner next time.